If you have your own practice, you just need a blueprint to follow. 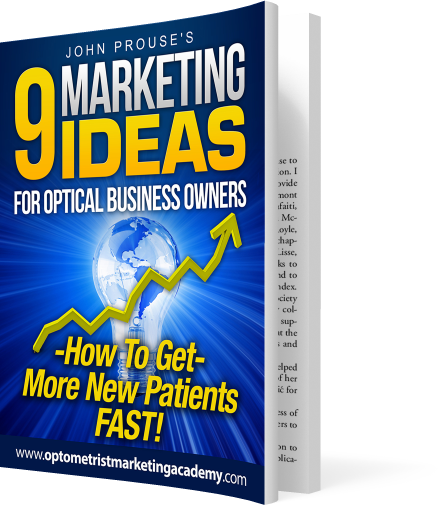 If you want straight shooting strategy tips for your optometry practice that is what you will get. Straight from the trenches of a real Optometrist. If you're ready to finally sort out your staff, to get out of working in your practice day after day & dramatically improve your success, then please read on. I’m an Optometrist and Independent Practice Owner. I started the business from scratch in 2011 and in year 3 implemented a system that turbo charged my success. It also reduced my testing days by nearly half. I want to show fellow Optometric Practice Owners like you, how I did it. You need to protect your business from the growing competition of the big national chains, cheap bucket shops and online websites. I urge you to read my report on the new way to market your practice, and how to attract your own steady supply of new patients. 1. How to get more new patients using simple, old school style advertising, that most optical practice owners are overlooking. 2. One small change to your practice, taking literally seconds to do, that will greatly improve your profits. 3. The “secret” strategy for attracting new patients I’m using in my own clinic – it’s the one that means I never have to worry about relying on “hope” that my patients come back. There’s so much more inside this report that I couldn’t possibly reveal in public, for fear of my competitors finding out. This is a step by step, fast action guide on how to grow your practice. There is a small fee of £10 because I don't want to give away this valuable information. Trust me, it puts off the freebie seekers. You will know from running your practice, these are not your ideal clients!